To celebrate the 15th Anniversary of The Greek on Halifax, Adelaide Food Central and other invited guests were treated to special VIP Luncheon to commemorate their success and to see the recent upgrades at the restaurant. Mother and son team, Ross and Mary Galantomos, gave us a tour of the restaurant and talked about what has worked for them in making the business successful. One major factor is they are constantly improving everything that they do; menus are revised, the interior has just been updated, and they’re looking at changing the crockery and cutlery. It’s a fine balance between not being boring and providing traditional good quality Greek food. They want to be cutting edge without going over the top. Another reason for their success is the way they treat their staff; if you treat staff like family, the staff will treat customers well and result in a great environment for everyone involved. Of course, let’s not forget about their consistently great food. With the VIP Luncheon menu in front of us, we knew it was going to be a very long and special lunch. Without making this article too long winded, we’re just going to talk about what we thought were the highlights of our meal. 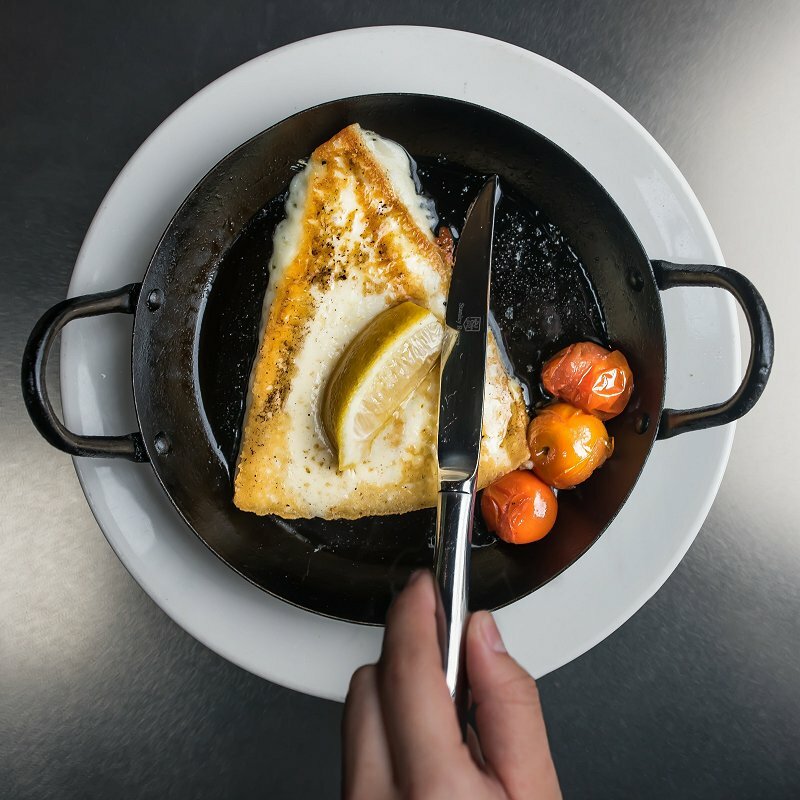 Saganaki Kefalograviera – Grilled Greek cheese served with roasted cherry tomatoes, lemon and olive oil. We don’t remember having Saganaki this good anywhere in Adelaide. The Greek cheese was perfectly melted and still retained its firmness. The natural sweetness of the cherry tomatoes perfectly balanced the tartness of the lemon. 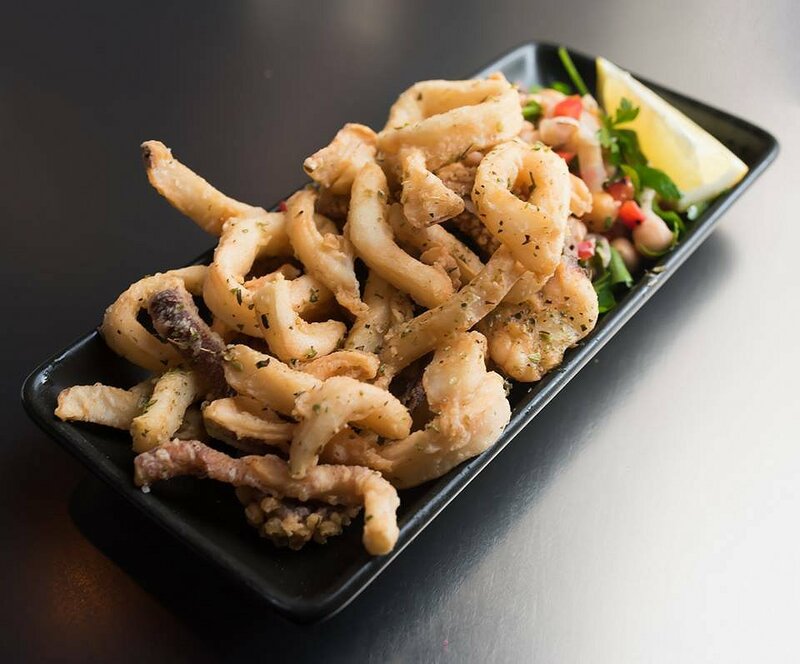 Kalamari Tiganito – Lightly fried calamari served with a chickpea, capsicum, red onion and parsley salad. The calamari was perfectly cooked in a light, crispy coating. On the side was a refreshing salad, that was equally as good as the calamari. Krokettes – Zucchini and cheese croquettes served with skordalia. 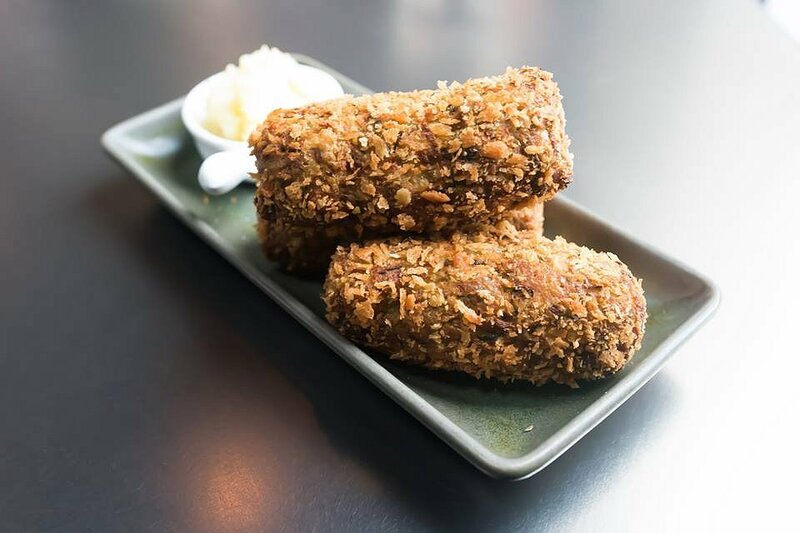 We’ve had quite a lot of croquettes in our time, but none like these. Inside the crunchy exterior were strands of zucchini held together by melted cheese. Combined with the smooth and creamy skordalia, it was a match made in heaven. 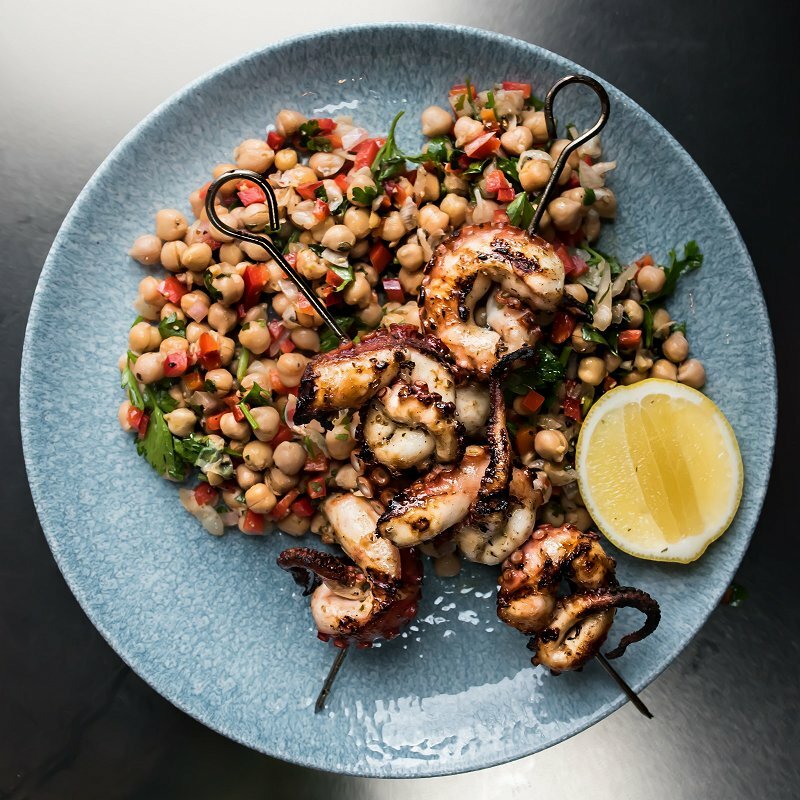 Octapothi Souvlaki – Chargrilled octopus served with a chickpea, capsicum, red onion and parsley salad. This dish was so simple and yet so delicious. The octopus was soft and delicate, and had lovely chargrilled flavours. Sitting on a bed of refreshing salad that we had in one of our entrees, you couldn’t really fault this dish. 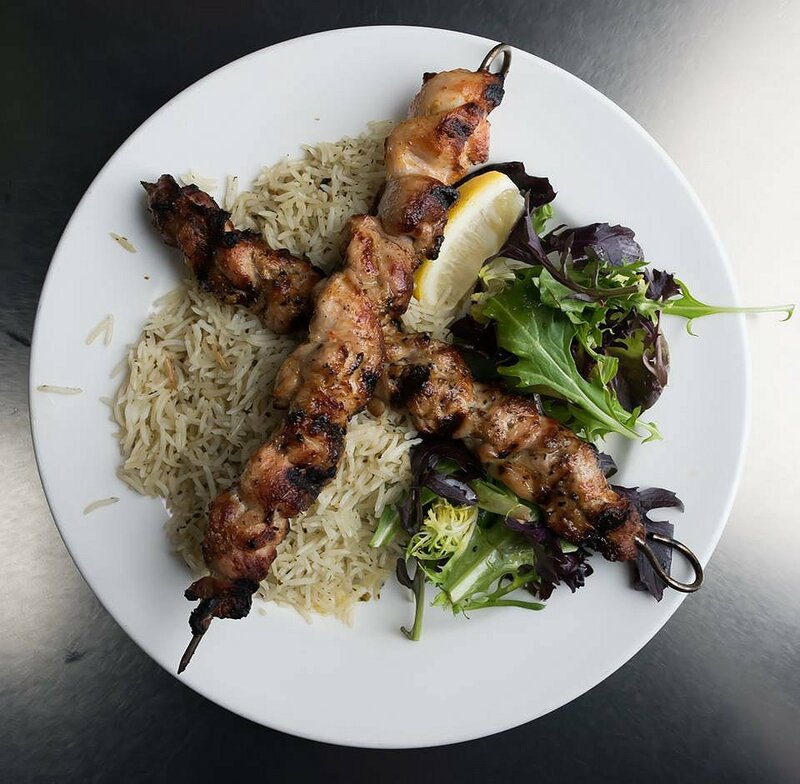 Chicken Souvlaki – Skewered chargrilled fillets of chicken served on a bed of rice. This dish is probably not as exciting as some of the others but it was executed really well. The chicken was well seasoned, and juicy and succulent, and again had lovely chargrilled flavours. 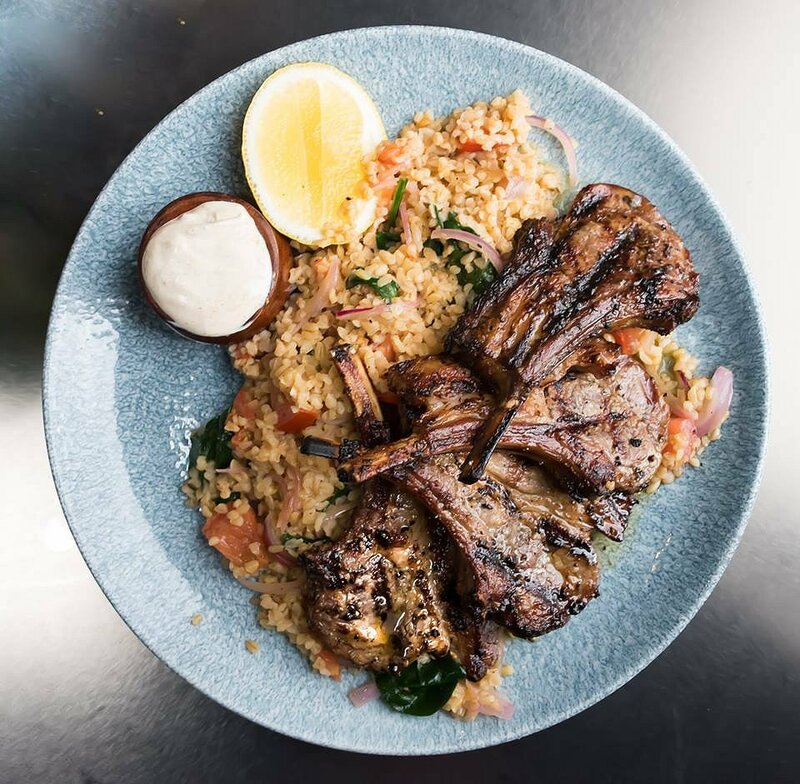 Paithakia – Marinated lamb cutlets, chargrilled and served on a village-style couscous. In Australia, we love our lamb, so why not marinate it and chuck it on the chargrill. The lamb was juicy and succulent with so much flavour. Perfect with the light and fluffy couscous. 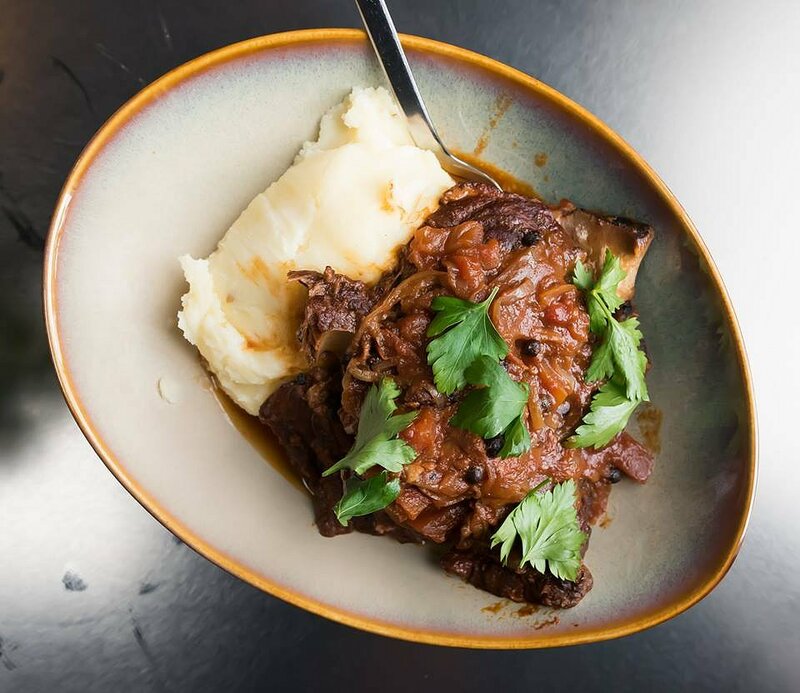 Kokkinisto – Tender goat, slowly braised in a red wine and tomato sauce, served on a potato mash. Something a bit different for the mains with a more rustic style dish. The goat was soft and delicate, and the meat simply fell apart. There was a hint of gaminess in the meat, but it was well disguised by the sauce. The potato mash was smooth and creamy, and absorbed the tasty sauce well. 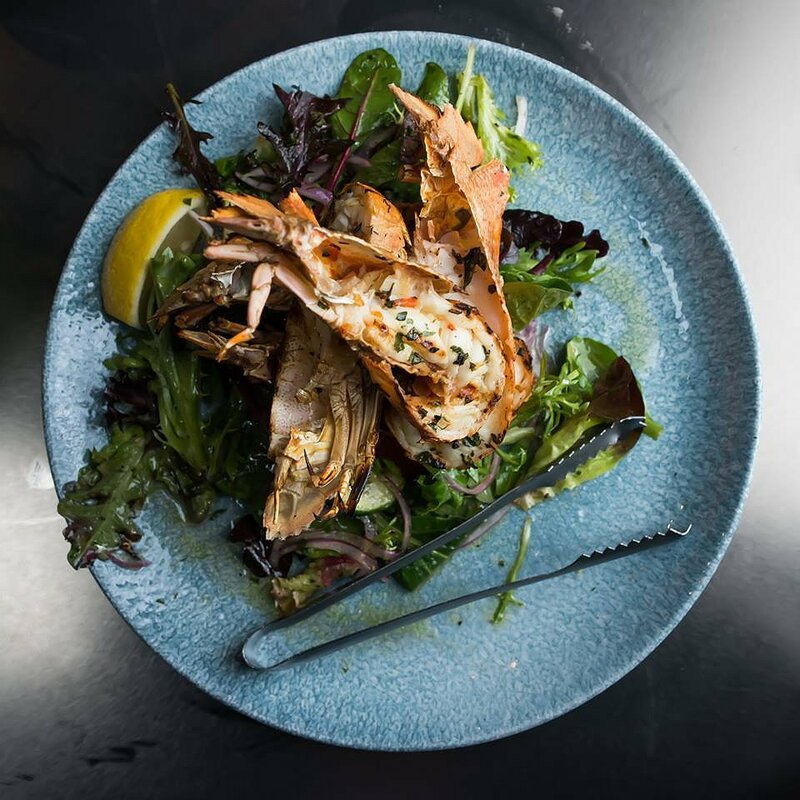 Moreton Bay Bugs – Marinated Moreton Bay Bugs, chargrilled and drizzled with lemon and olive oil dressing on a herb, garlic, cucumber, mesculin and red onion salad. We’re big fans of Moreton Bay Bugs and even bigger fans of this dish. The bugs were perfectly cooked with lovely chargrilled flavours. Sitting on a bed of fresh and crispy salad, this is something we could eat everyday. 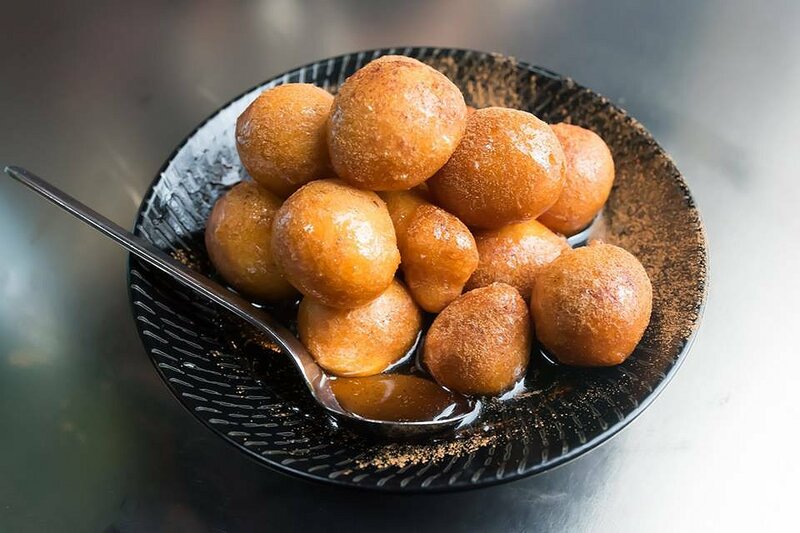 Loukoumathes – Hot honey puffs drizzled with honey and dusted with cinnamon. These are best eaten when hot and they were certainly fresh out of the fryer when they arrived. These honey puffs were crispy on the outside, and light and fluffy in the centre. Smothered with generous amounts of honey and cinnamon, it’s a great dessert to end any meal. The VIP Luncheon to celebrate the 15th Anniversary of The Greek on Halifax was certainly a meal to remember. Each and every dish that came out was simply amazing, and the sheer amount of food had us all rolling out of there. We’d like to thank the owners, Ross and Mary Galantomos, and all their staff, for the delicious food and kind hospitality. We can see their next 15 years being quite successful. The Greek on Halifax is open for breakfast 8am-11:30am Monday to Friday and 8:30am-11:30am Saturday and Sunday, for lunch 12pm-3pm everyday, and for dinner 6pm-9pm from Sunday to Thursday and 6pm-10pm Friday and Saturday.